While Sprint and T-Mobile have seemingly passed on the new Moto X (2nd gen), US Cellular is willing to add this year’s flagship from Motorola to their line-up. 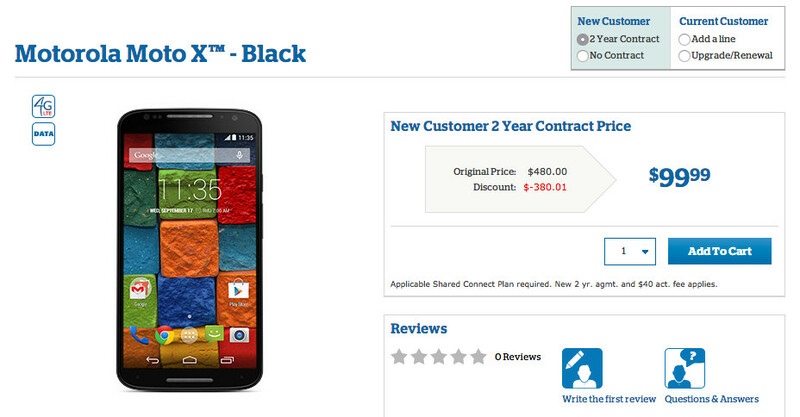 As of today, you can buy the Moto X in black for $99 with new 2-year contract. Later in October, US Cellular will also make the black leather and bamboo backs available at a price of $149 on-contract. I probably don’t need to tell you about the new Moto X, since you have likely already read our review. You have, right? If not, just know that this phone is up there with the best of the year because of its in-hand feel, use of premium materials (dat leather, tho), and mostly stock Android that has been beefed up in all the right ways through Motorola’s suite of “Moto” software. The only issue we had with the new Moto X was its mid-range battery life that typically emptied between 14 and 16 hours of use. On US Cellular and need a new phone? This is one to put on your shortlist. Designed with a sense of style and balance, the Moto X incorporates the use of genuine wood and leather and is equipped with the latest version of the pure Android experience along with quick access to the latest updates. With the Moto Voice, the Moto X’s enhanced voice control lets you select a custom prompt, and use your voice to do just about anything. From the curved metal that frames the vivid 5.2-inch Full HD display with durable Corning® Gorilla® Glass, the all-new Moto X weighs only 144 grams and has a 13 megapixel camera with Quick Capture and LED Flash. Moto X includes 16GB of onboard memory. Do more using just your voice. Moto X responds to your voice, without you having to touch it. Create your own voice prompt, ask questions, or even post your status to Facebook. Adapts to you, not the other way around. Your Moto X knows whether you’re in a car, in a meeting, or at home, and adapts its behavior and the information it gives you accordingly. Interact naturally. Respond to your Moto X with simple gestures—without having to touch the phone. Simply wave your hand above the phone to silence calls or alarms. Or launch the camera with just two flicks of your wrist. With U.S. Cellular’s $0 down equipment installment option (for qualified customers), customers pay tax on the Moto X at the point of sale, and then make 24 monthly payments of $20 that are conveniently added to their wireless bill for the black version ($21.67 per month for the black leather and bamboo versions). Customers can upgrade this device in as little as 12 months if they trade it in for an updated model, and they can also choose to pay off the full balance of their device anytime they want. Currently 90 percent of U.S. Cellular customers are covered by a 4G LTE network, and more than 93 percent of customers will have 4G LTE speeds by the end of 2014.